Choose a soft and strong leather basket dog muzzle. 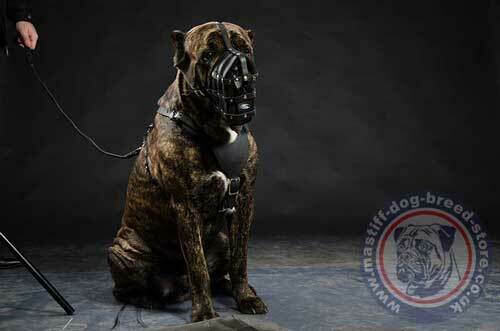 Cane Corso mastiff muzzle made of leather is a very comfortable model of dog muzzle for any dog breed. Special leather basket design is created individually for each dog breed snout size and shape. 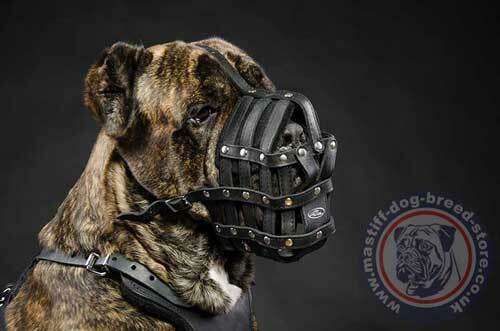 Leather mastiff muzzle combines the best features: strength, comfort, security and ventilation. 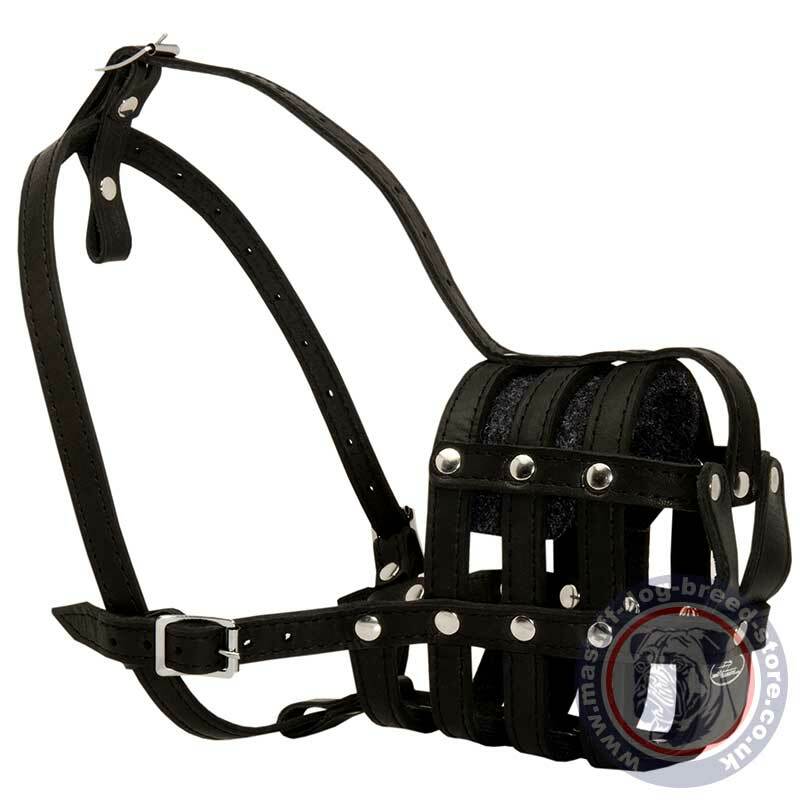 If you wish to prevent dog biting, licking, chewing and picking up from the ground, but at the same time make a dog feel comfortably, choose this leather dog muzzle for your Cane Corso mastiff. Cane Corso mastiff muzzle is handmade. We use special strong genuine leather. The straps are with smooth polished edges, reliably stitched and riveted at the joints. Simple and comfortable, super ventilated basket form allows to use this mastiff muzzle in cold and hot weather. In frost it does not stick to dog skin like a metal muzzle. There is a soft felt lining in the front upper part to prevent rubbing of dog skin. It is difficult for a dog to take off this muzzle with paws as it is reliably fixed on dog's head with belts and buckles along dog's neck, by the sides and between eyes. Large, Strong Mastiff Muzzle UK Bestseller! Height: dog mouth should be slightly open while measuring. 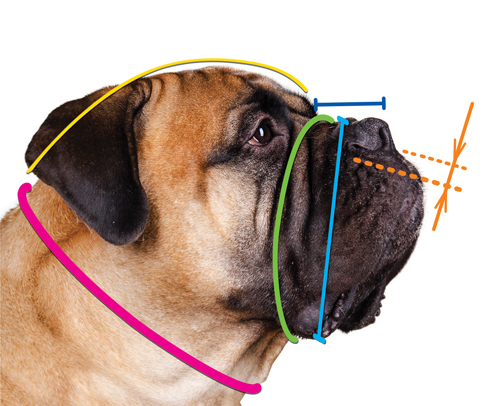 Reliable dog muzzle for a large dog like Cane Corso mastiff is not necessarily should be a strong wire cage. This leather dog muzzle is quite strong to keep a dog from biting, licking, chewing and picking up strange objects. Leather dog muzzle is soft and strong. We use genuine leather of top quality. It is thick, strong and durable. Store leather items properly. Process the muzzle with special moisturizers for leather items to prevent cracking and overdrying of leather and keep it flexible. Keep a leather dog muzzle clean. Clean it after each use with wet rug to eliminate dog saliva, dust and prevent microbial growth. If a leather dog muzzle got wet, let it get dry naturally, far from direct sunrays and open sources of heat.